In collaboration with Bath, Bristol, Imperial College and Oxford, Warwick will establish (from October 2007) an EPSRC supported taught course centre for the mathematical sciences. This wil provide specialist lecture courses aimed specifically at PhD students. There will be approximately twenty courses a year to choose from. Some of the lectures will be delivered at Warwick, and the others will be transmitted via live links from each of the other universities. In addition, regular event days will be arranged so that students and staff can meet at a common venue. These courses will draw upon the combined expertise of the participating universities to greatly enhance the provision of courses for the PhD students of all five departments. Details will appear on tcc.maths.ox.ac.uk. Peter Topping has won the 2006 Philip Leverhulme Prize for work in geometry, analysis and nonlinear PDE. His main focus has been on geometric flows, especially the harmonic map flow and the Ricci flow. The Prizes commemorate the contribution to the work of the Leverhulme Trust made by Philip Leverhulme, the Third Viscount Leverhulme and grandson of the founder. The announcement of the 2006 Prizes. 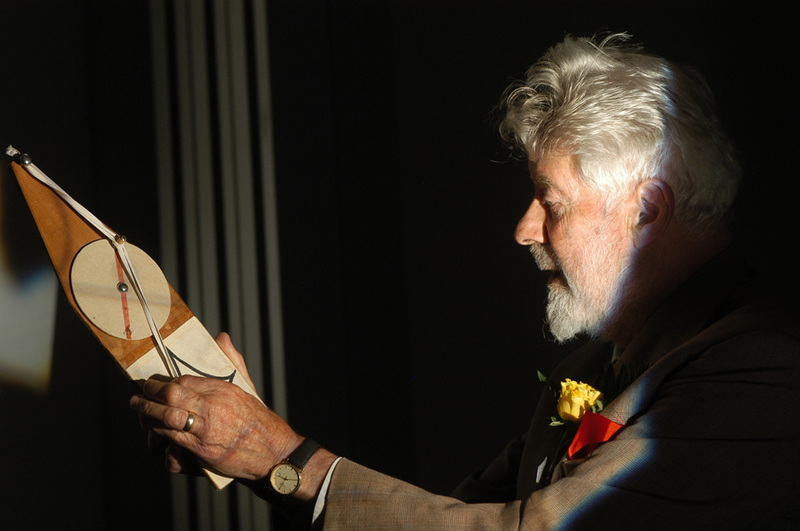 The Councils of the London Mathematical Society and the Institute of Mathematics and its Applications have announced the award of the 2006 David Crighton Medal to Professor Sir Christopher Zeeman, FRS, founding Professor of Mathematics at the University of Warwick and later Principal of Hertford College, Oxford in recognition of his long and distinguished service to mathematics and to the mathematical community in all areas – in research, to mathematics in higher education, to the mathematical societies, and in outreach activities with schools and the public. The David Crighton Award was instituted by the IMA and LMS in memory of Professor David George Crighton FRS, (15 November 1942 – 12 April 2000) a former President of the IMA and President-Designate of the LMS at the time of his death. David was Master of Jesus College, Cambridge, and Professor of Applied Mathematics at Cambridge University; he was a leader in the fields of Fluid Mechanics and Applied Mathematics, influencing their progress nationally and internationally through his contributions both to research and administration. The Medal is awarded triennially to an eminent mathematician for services both to mathematics and to the mathematical community. Bill Parry died at the age of 72, around 1am on Sunday morning 20 August of cancer, exacerbated by MRSA. Bill was the first appointment in analysis at Warwick. He played a key role in the department, and was Chair of the Department for 2 years. The rapid rise of the Warwick Mathematics Department's international reputation was due to many, among whom Bill featured prominently. His great mathematical achievements were recognized by his early election to the Royal Society. He attracted a number of outstanding Ph.D. students. 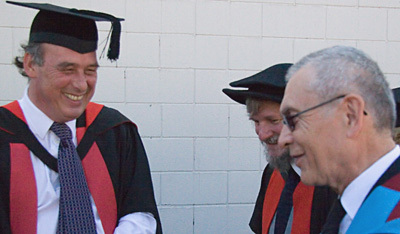 Bill became an Emeritus Professor of the University upon his retirement. A memorial gathering for Bill was held at 3.30pm, Wednesday 18 October 2006 in the Mathematics Institute Common Room. She was interested in the dependence on the number of activities and the number of children in the car, as well as the length of the journey. He agreed to help as a fun exercise for people to think about as they set off on holiday with their children. The equation and an audio version of an interview can be found here. Twelve second year Mathematics students have set off for Africa to teach mathematics in Johannesburg schools. The costs of the project are being met by generous donations by graduates of the Department and University and the companies they now work for, incluing 3i and BA. All the students took the IE2A6 Introduction to Secondary School Teaching module last year. This module is run in conjunction with the Student Associate Scheme (SAS) organised by the Warwick Institute of Education, and involves academic work and a 3 week placement in a local school. Since it's introduction 2 years ago, the module has proved hugely attractive to Mathematics students with a potential interest in teaching as a career. See the University press release for more information. Seen here with the Chair of Department, Collin Sparrow (left) and Miles Reid FRS (centre) who also gave the oration. In a bid to EPSRC led by Mathematics and Physics, Warwick has been selected for funding of a Centre dedicated to training a new generation of complexity scientists at PhD level, teaching knowledge and skills to understand, control and design complex systems, and to do innovative research in complexity science via critical thinking, interdisciplinary teamwork and end-user interaction. The new Centre is described here. The award is expected to include some thirty PhD studentships and initial funding for three lecturers, and comes on top of Warwick's recent success in gaining six RCUK Academic Fellowships in Complexity Science. A wide range of departments are involved as well as Maths and Physics, including Computer Science, Chemistry, Engineering, Psychology, Statistics, WBS, WMG, and WMS. For more information see the Complexity Science website. 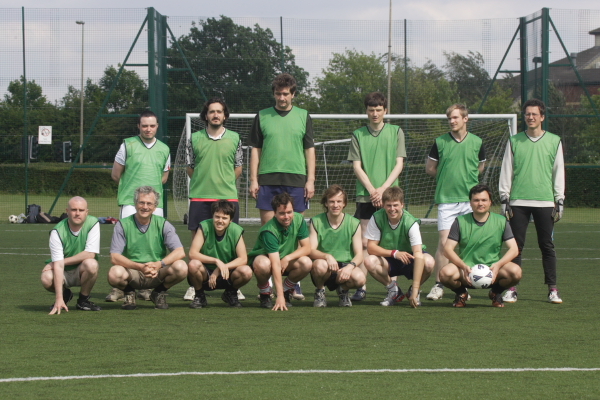 University of Warwick, Coventry, 20.6.2006, from our special correspondent. 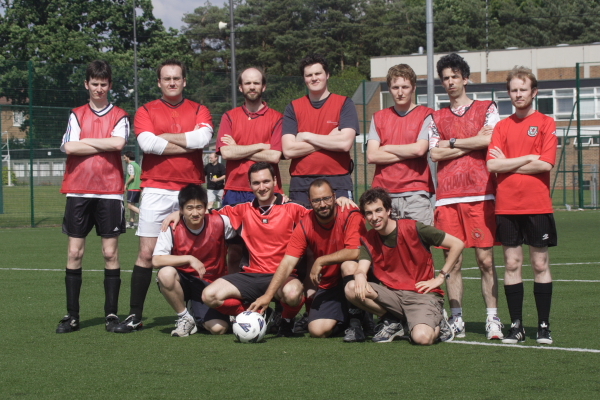 “It was always going to be a tall order to match the heroics of the 2005 Staff vs Students championship final. Back then, the young pretenders swept all before them with a grace and style befitting of such a prestigious occasion. Ravaged by injuries and with several players lacking match practice, the students were not confident of a repeat success. The game began at a frantic pace with the students taking an early lead thanks to O'Callaghan's close range effort. The Tarkett Sommer pitch was rocking. As the interval drew near however, a sucker punch. Against the run of play, and thanks in part to some controversial decisions from the referee, Naudot fired in from the edge of the area. The floodgates were open, and the staff scored 4 more to end a dismal half for the students. Zygalakis tried to rally his troups at half time as the smug faculty looked on. However, the second period began with more of the same as three more goals made it 8 for the staff including 4 for man of the match Markovic. PROFESSOR MILES REID FRS, of the University of Warwick, is awarded the Senior Berwick Prize for his paper with Alessio Corti and Alexander Puklihkov, Fano 3-fold hypersurfaces, published in Explicit birational geometry of 3-folds (LMS Lecture Notes Series 281). The paper made a big advance in the study of 3-dimensional algebraic varieties. The first deep result on the birational geometry of 3-folds was the 1971 theorem by Iskovskikh and Manin that a smooth quartic 3-fold is not rational. The Corti-Pukhlikov-Reid paper vastly generalizes this result, by showing that all 95 of the Fano hypersurfaces in weighted projective spaces are not rational. In fact, much more is proved: these varieties are birationally rigid and in that sense are far from rational. The paper combines the methods of Mori theory with the Russian school of birational geometry, and has formed a foundation for a lot of later work. PhD studentships for graduates from Maths, Stats, Computer Science and Physics are available from the newly awarded BBSRC/EPSRC Systems Biology Doctoral Training Centre. Contact Professor D A Rand, dar@maths.warwick.ac.uk, if you are interested. Volker Betz has been awarded an Advanced Research Fellowship by the Chemistry Panel of the EPSRC to study Nonadiabatic Transitions in Quantum Dynamics. In both cases there will be transitions of the nuclear wave function between the corresponding electronic energy subspaces, and the challenge is do understand the precise quantum dynamics of these transitions. In the first case, the transitions are exponentially small, and the problem is one of asymptotics beyond all orders. I will try to make progress on the special problem as well as on the general theory. In the second case, the transitions are of order one. They have been found to be the key mechanism in many important (photo-)chemical reactions such as the photo-dissociation of ozone or the reception of light in the retina. Consequently, they are a topic of great current interest in quantum chemistry, but in particular the important high-dimensional situations are still not very well understood. In a joint effort with theoretical chemists we will study those and related situations, employing recent mathematical techniques such as space-adiabatic perturbation theory or microlocal analysis. Martin Hairer has been awarded an Advanced Research Fellowship by the Mathematics Panel of the EPSRC to study Ergodic properties of stochastic processes. The driving noise may not act on all degrees of freedom of the system directly but spread to them indirectly through the action of the dynamics. The system may have infinitely many degrees of freedom. The values of the noise process driving the system at two different times may have non-trivial correlations (extrinsic memory). The evolution of the system may depend explicitly on all or part of its past (intrinsic memory). The University of Warwick has won an EPSRC Science and Innovation Award of £3.8 million to set up a Centre for Discrete Mathematics and its Applications led by Mike Paterson of the Department of Computer Science. The Warwick project will be rooted in three internationally recognised departments at the University of Warwick: Computer Science, Mathematics and the Business School. the development of collaborative research, rooted in discrete maths, and involving researchers at other UK universities. See the University press release for more details.